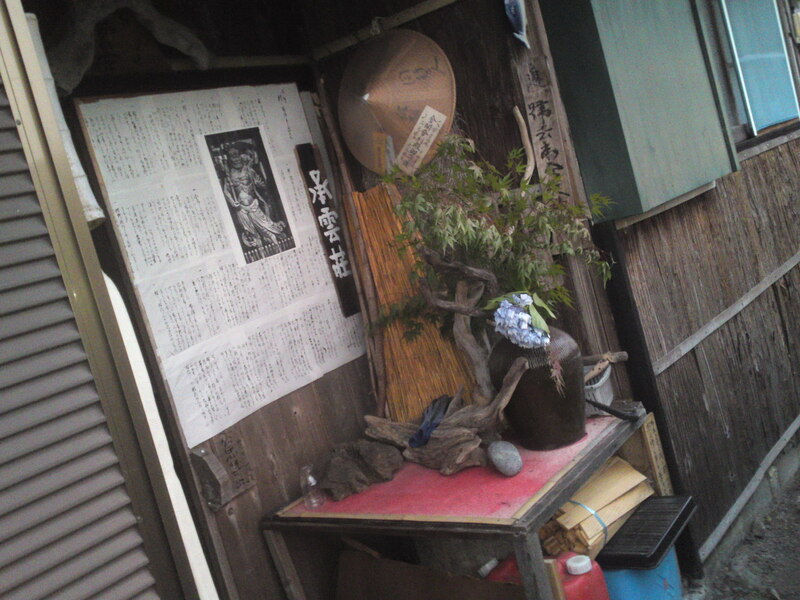 I finally managed to pay a belated visit to my good friend Osamu Kurosawa in Ieyama, Shimada City! 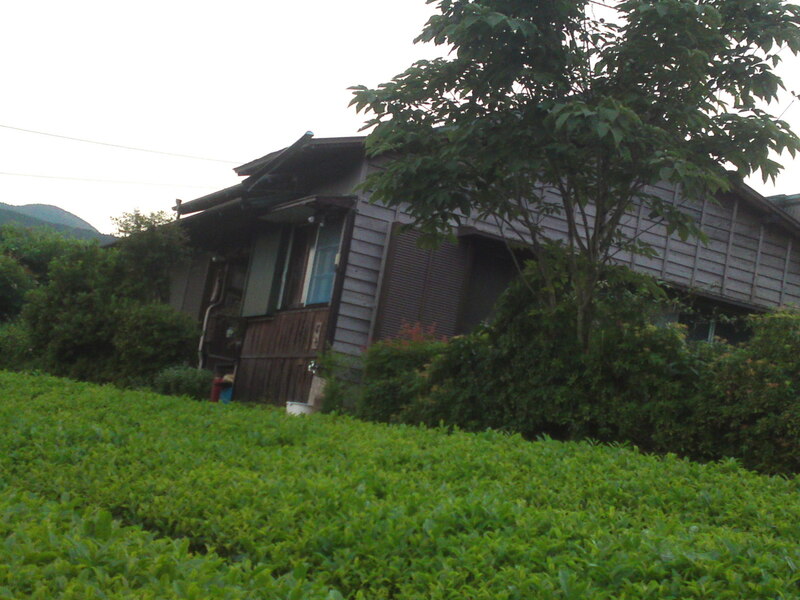 Mr. Osamu Kurosawa, a very old friend of mine, decided after retirement as an officer at the Shizuoka Municipal Library to buy an old farm house in Ieyama, Shimada City for a meaningful life, now that he has plenty of time not only to really enjoy it but to make other people also share his pleasure. 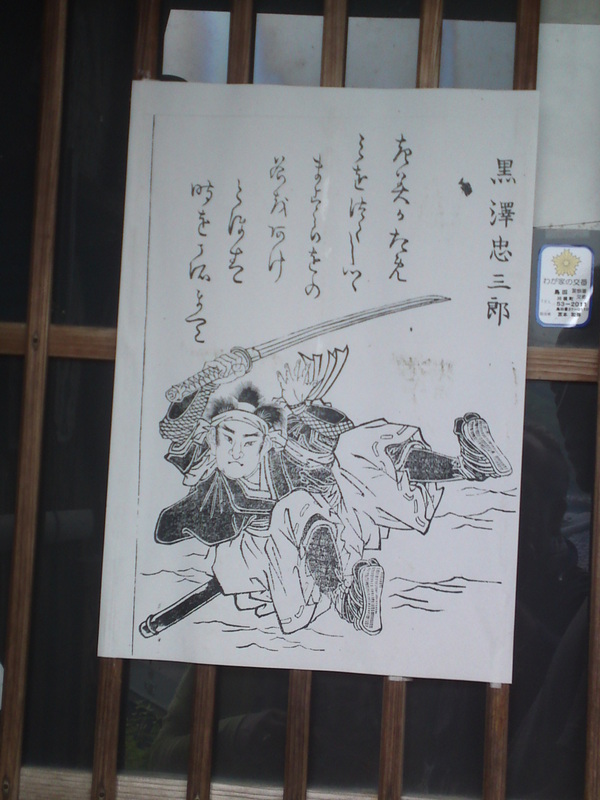 Osamu is actually the recognized expert on Shizuoka, especially Shizuoka City, history and culture and has already published a number of books and papers on it. He does not intend whatsoever to rest on his laurels and has embarked on a mission to promote the town he is presently living in. 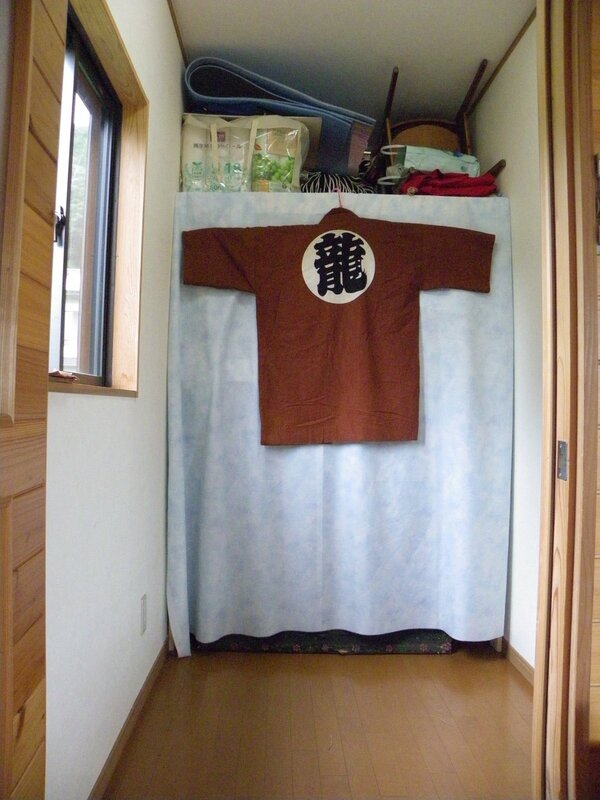 He has just registered his home a member of Japanese Airbnb under the name, “Shimada Ieyama Shounso”, to provide cheap accommodation with all necessary facilities for people and tourists wishing to experience the real Japanese rural life in the “outback” of Shizuoka Prefecture! 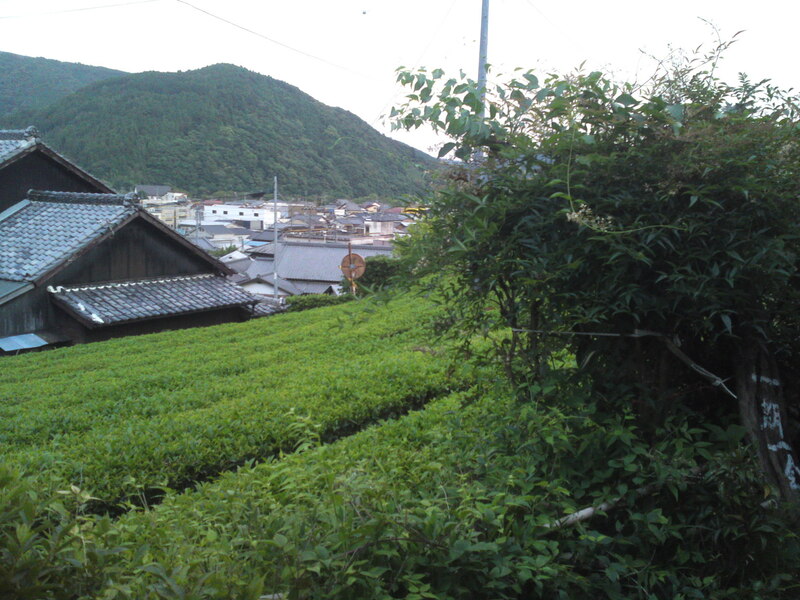 The small farmhouse has been completely refurbished for comfort and everyday life at a walking distance from Ieyama Station along the Oigawa Railway Line extending from Kanaya, Shimada City to Ikawa in the Japanese Southern Alps! The view from the first floor entrance! 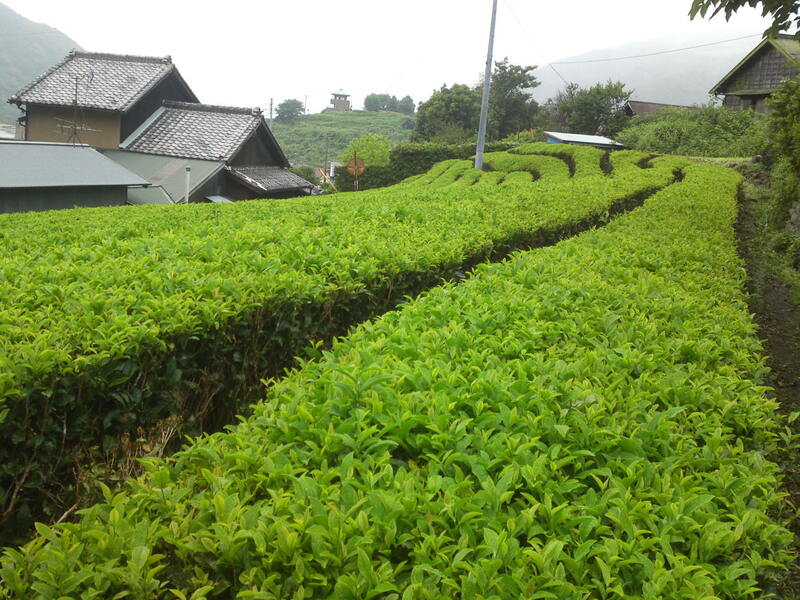 It stands by real tea fields of Kawane, producing top-class green tea in Japan! The entrance itself gives a good indication of what to expect inside! Ask Osamu to translate his own life’s philosophy! 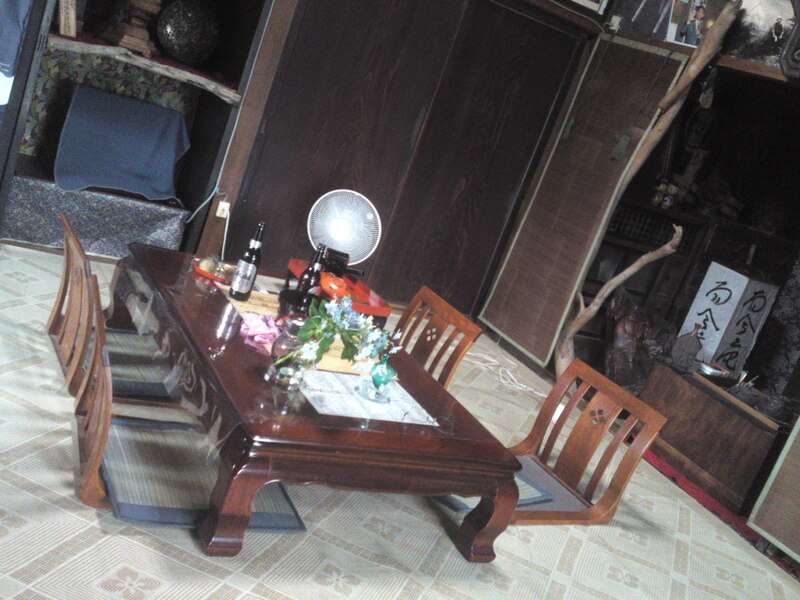 I have already described the interior during my first visit and second visit. 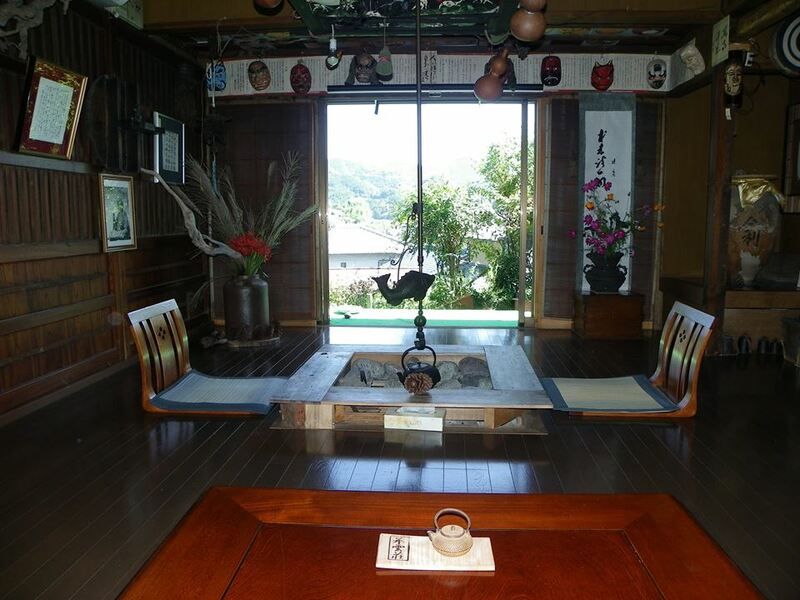 The place has been considerably reformed since, especially the kitchen and the tatami room here above! 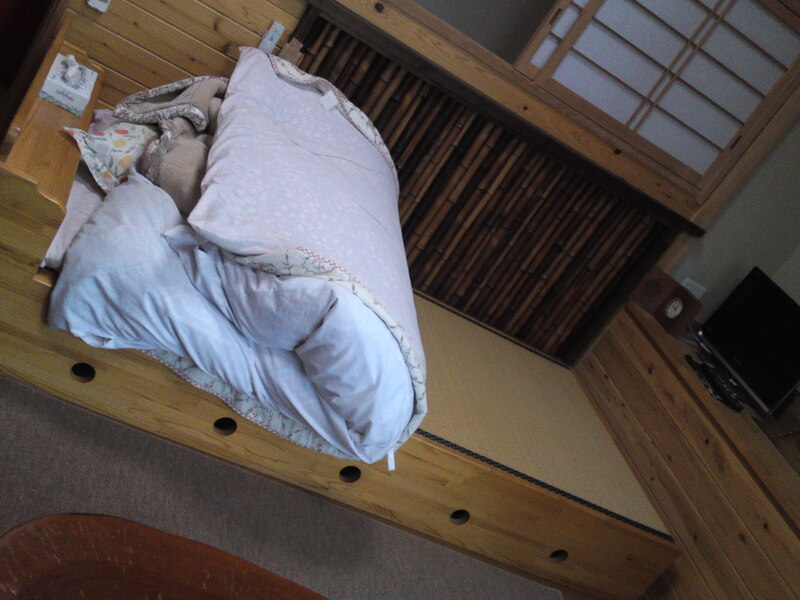 The guest room on the second floor! Sorry, it was a bit dark when I visited it! It has its own terrace! 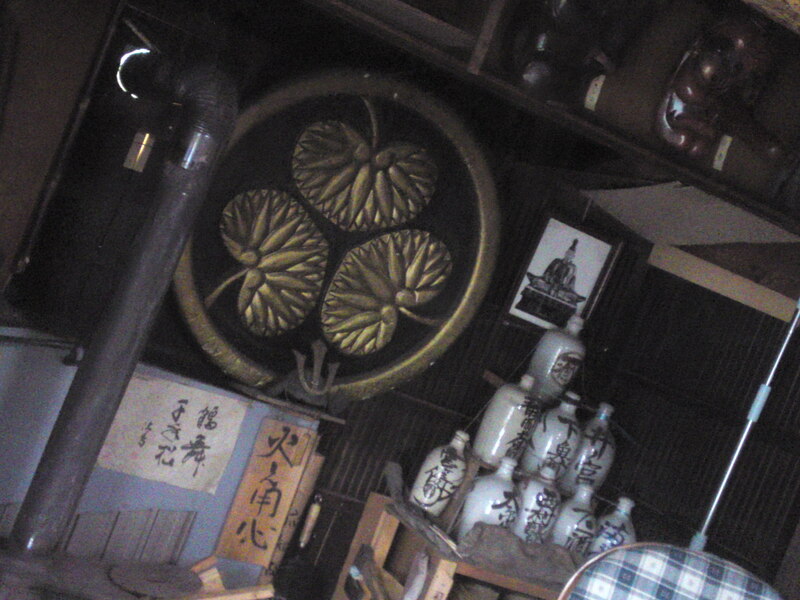 The place is still full of artifacts and real history and antiques that Osamu will have a pleasure to introduce to all! 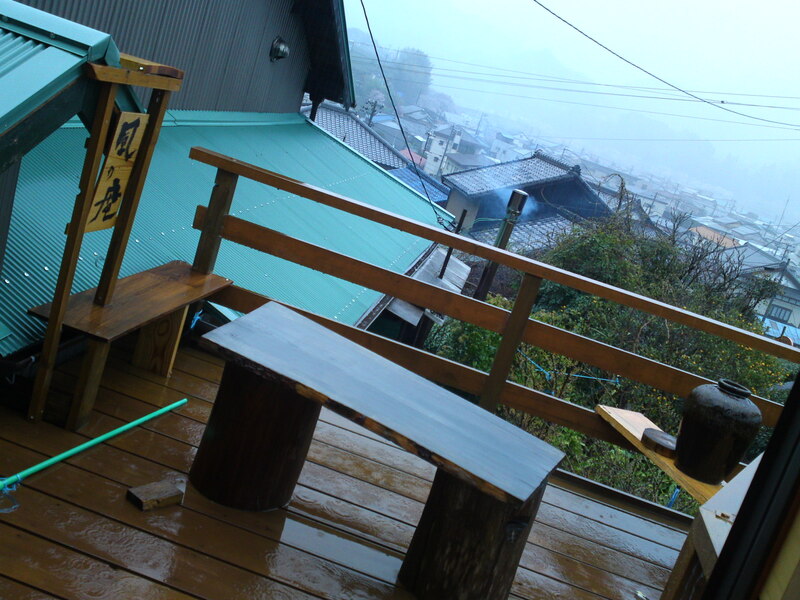 But my favorite place is still the Japanese traditional hearth (irori/囲炉裏), whatever the season! 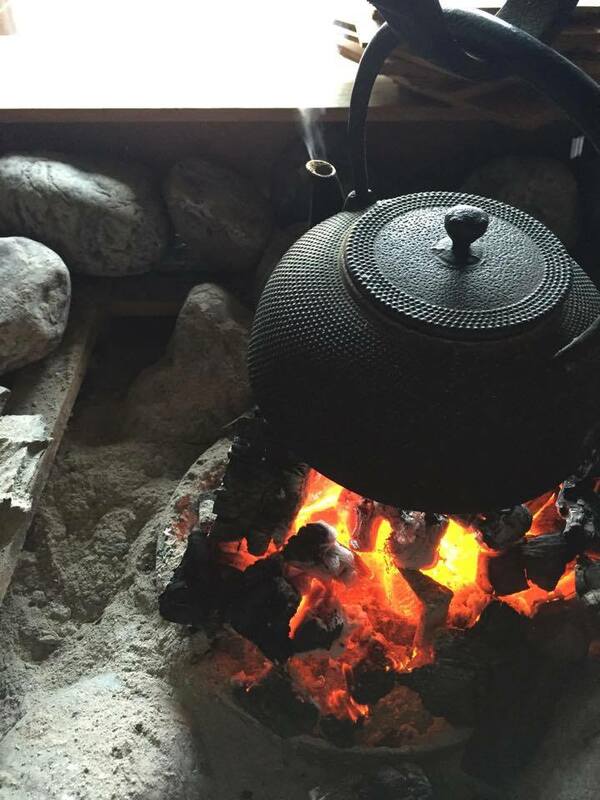 Always ready for a cooking fire! 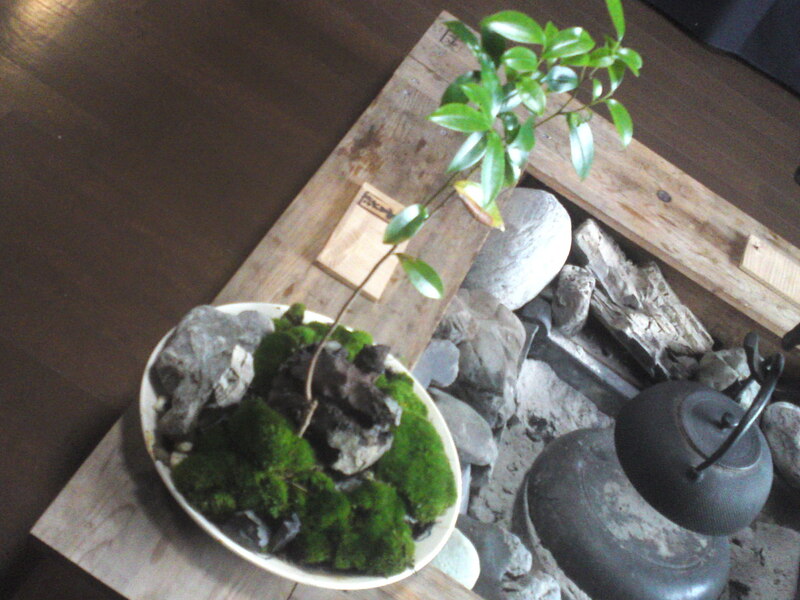 A landscape pot made with local wild plants! 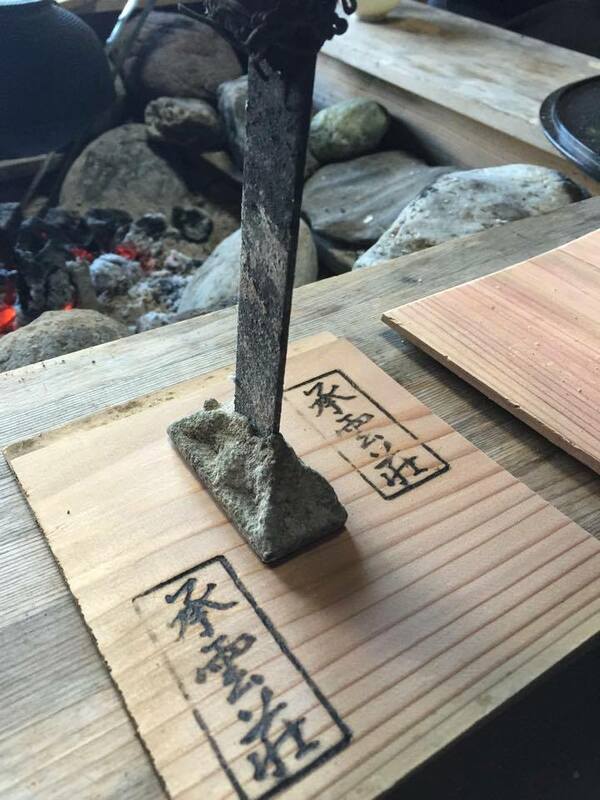 Osamu went as far as to create his own coasters and under-plates! 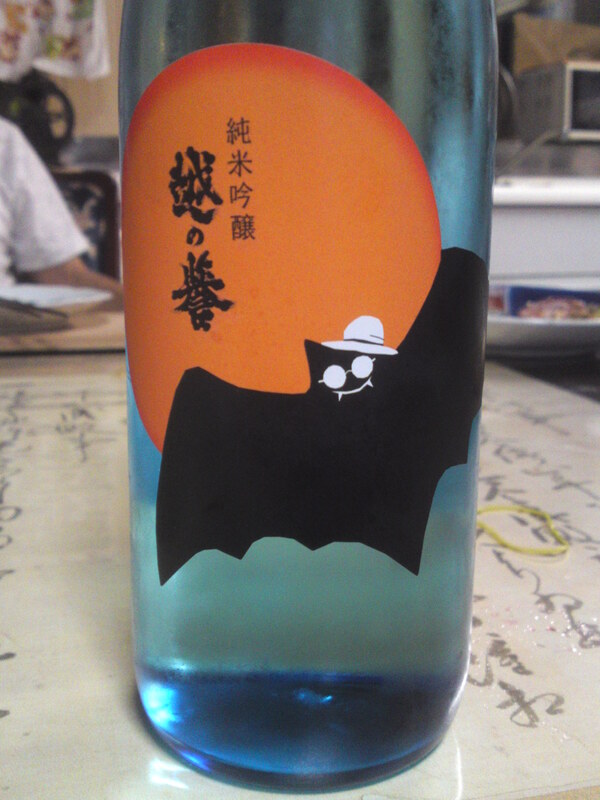 I had brought a very unusual sake from Niigata prefecture for Osamu who is a great lover of good food drink! 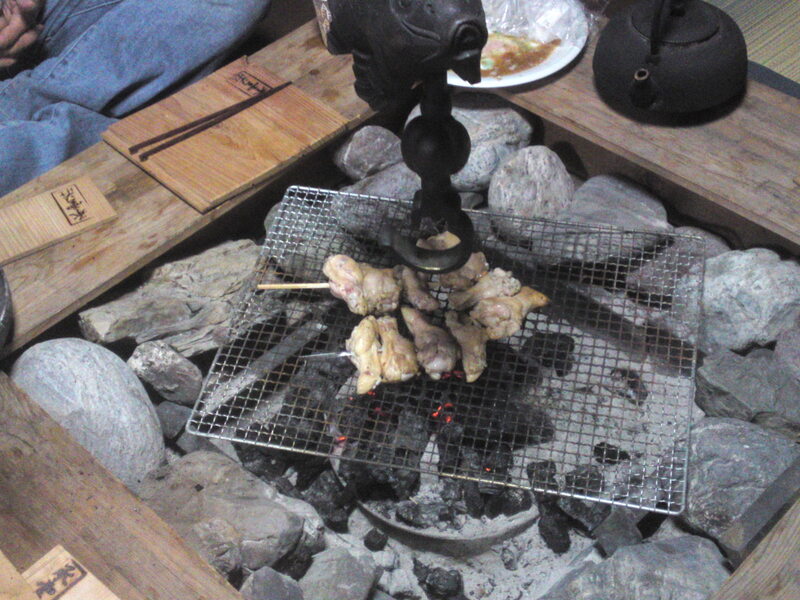 We shared around a barbecue of enormous chicken wings cooked over charcoal! Do visit Osamu Kurosawa on his FACEBOOK blog as he is fluent in English and Spanish!